Russell Mill offers both tennis lessons and tennis teams over an eight week period from June – August. Our tennis program has strong coaching, lead by our awesome head coach, Chris Andros. He is a top notch player and is currently the Boys Tennis Coach at Lowell HS. Chris is currently a Social Studies teacher at Greater Lowell Tech. Chris played 4 years at Franklin Pierce College for one of the top ranked teams in the NAIA. He was recently named to the Franklin Pierce Athletic Hall of Fame. We are very excited to also offer a USTA team, see below for more details! Tennis lessons are held in the morning and early afternoon. During the spring activity sign up period you can choose from either a Monday-Wednesday or Tuesday-Thursday lesson slot. Lessons are grouped according to age. Children age 3 (if they are strong enough to manage a racquet and are able to follow directions well) to age 18 are welcome to join. Instruction for the younger age groups will be focused on the basics (holding the racket, hitting the ball, foot work) and an introduction to the rules of the game. For the older players introduction and refinement of the strokes, mechanics of serving and rules of the game are taught. Above all, the emphasis of the lessons is to have fun! We have both an “A” and a “B” tennis team. 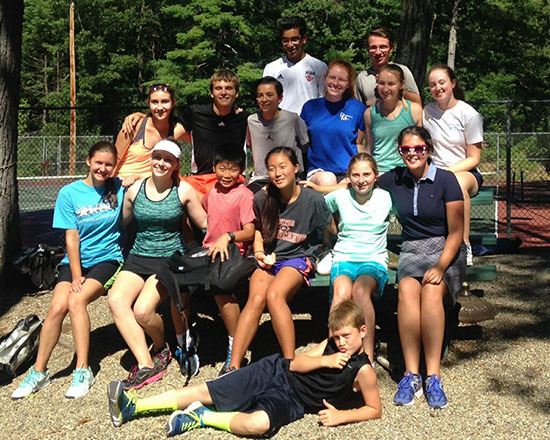 The “A” Tennis team competes in the Sudbury Valley Junior Tennis League. The number of matches fluctuates from year to year depending how the divisions are set. This league is for players 16 and younger. The “A” Team matches consist of 5 Individual Matches (3 singles and 2 doubles). The team that wins at least 3 of the 5 matches is deemed to win the team match. The “B” Team matches are geared toward players with limited competitive experience. There is no age limit to “B” Team tennis. The only requirement is that players be able to serve and engage in a rally on a fairly consistent basis. “B” team matches are held between Russell Mill and CS&T on Fridays, with the clubs alternating hosting duties. Try-outs are held annually for each of the tennis teams. In addition to the Sudbury Valley League we are excited to offer a USTA Junior Tennis Team. The USTA (United States Tennis Association) runs leagues across the country where area clubs play each other.The teams are Co-ed with the following matches: Girls Singles, Boys Singles, Girls Doubles, Boys Doubles, Mixed Doubles. The season is five weeks long and runs from the end of June through the end of July with playoffs held at the end of the season. While being a member of the club is not a requirement to be a member of a USTA team, club members will be given priority, with non-club members as substitutes. If you would like to be a part of one of these teams, or if you have any questions about the teams or the USTA, please e-mail us at tennis@russellmill.com.